Many of you living in Portland have heard that acupuncture is best known for its ability to get you out of pain — headaches, arthritis, low back pain — all are treated masterfully by an acupuncturist. What is not so well known is how great acupuncture is at treating muscle strains/tears brought on by sports injuries. 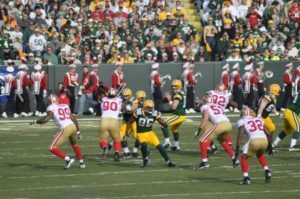 This week that may have changed when Aaron Rodgers, quarterback of the Green Bay Packers, thanked his acupuncturist twice during his post-game press conference. He tore a muscle in his calf 2 weeks prior to the end of the season, and since then has not been at full capacity. Rodgers seemed to be managing alright in week 17 when he re-injured the muscle. As he went to the locker room to be examined, Packer fans held their breaths, worried about what this might mean for the rest of the season. In the past two weeks, Rodgers spent a lot of time with his trainers and also relied heavily on his acupuncturist to get him ready for last weekend’s playoff game. Although he was not in top form, Rodgers turned in an MVP-worthy performance nonetheless. His enthusiasm for acupuncture in the post-game interview made it clear that he felt he would not have been able to turn in that performance without it. He now knows that acupuncture is a key part of recovering from any traumatic injury — including a sports strain or sprain. Acupuncture has a knack for doing two things: releasing endorphins and triggering the immune system to speed healing. The endorphins help relieve the immediate discomfort, while triggering the immune system can significantly reduce healing time. At the same time, a skilled acupuncturist can treat all of the supporting muscles and tendons to keep them supple and strong in order to ease the burden on the injured area. All of this adds up to quicker healing, and less pain and more function while you do heal. While not everyone has a recovery for the record books, in my clinical experience healing times almost universally beat the prognosis when acupuncture becomes part of the treatment plan. The keys to faster healing include following your acupuncturists recommendations for frequency of treatment as well as outside care, resting the injured area as much as is possible, and beginning care as soon after the injury as you are able. Ideally you would begin acupuncture within the first 24-48 hours for the best outcomes. Sports injuries do not have to keep you sidelined for long. If you live in or around Portland and have more questions about acupuncture for sports injuries, leave a comment or email me.